Nowadays,most of wedding ceremonies are hold in the hotels,always the same process and the same atmosphere. And more and more young people are tired of this. And the data shows that more and more people get married in recent years. So it is very hard for the bride and bridegroom to find a suitable hotel to have the ceremony,so they are forced to change the date or change to other hotels. Have you ever thought of a new form wedding? –holding wedding ceremonies in marquees. Holding weddings in marquees can not only solve the problem of limited place,but also provide a special lifetime good memory about wedding for you. Compared with hotel ceremony,holding weddings in marquees are more flexible. No place and scale limited,Indoor or outdoor,100 people or 1000 people,you can choose them by yourself. Holding weddings in marquees also no time limited. You can set up the wedding marquees one or days before the wedding,and you can control the time of the party by yourself. 2014 Unique Luxury Wedding Tent can give you a romantic and memorable wedding who holding wedding outdoor. Nowadays now , more and more people would like to hold weddings outdoor instead of hotel.They broke the traditional customs to hold wedding in the beach instead.However, it’s the problem that they could exposure in the sun, it’s terrible. Don’t hurry,The fabric of wedding tent has 650g/sqm PVC coated fabric with UV-resistant, and the main profile of 120*300*5.5mm Aluminum alloy(4 channels) with 120km/h wind loading. 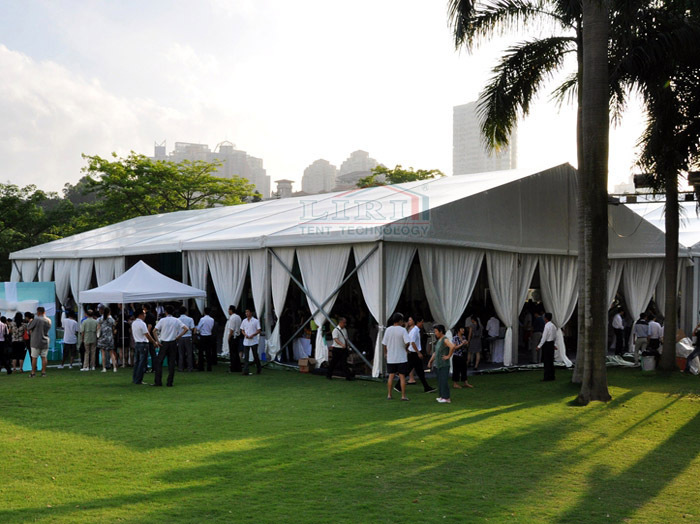 Therefore, you can feel at ease in holding weddings for outdoor if you have this wedding tent.